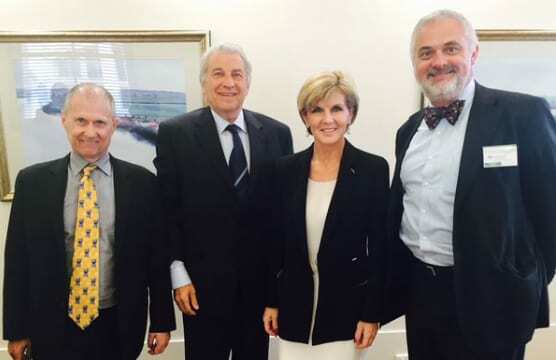 Zionist Federation of Australia President Dr Danny Lamm, Vice President Sam Tatarka and Public Affairs Director Ted Lapkin have met with Foreign Minister Julie Bishop at the Commonwealth Parliamentary Offices in Melbourne. Dr Lamm had just returned from the 37th World Zionist Congress in Jerusalem where he met with senior officials in the Israeli Ministry of Foreign Affairs and spoke to Prime Minister Netanyahu. During the course of the meeting in Melbourne, Dr Lamm conveyed the high regard in which the Israeli Government holds Foreign Minister Bishop, Prime Minister Turnbull and former prime minister Tony Abbott. He was also able to inform Ms Bishop of Israel’s particular appreciation for Australia’s vote last December against a Palestinian-authored UN Security Council resolution calling for an unconditional Israeli-withdrawal from Judea-Samaria and the establishment of a Palestinian state. Mr Tatarka addressed the unique set of security concerns faced by the Australian Jewish community at the present time. The meeting was extremely warm and constructive, covering the recent wave of terrorist violence in Israel, the challenge of BDS and the situation in the broader Middle East.